Received: September 19, 2017; Revised: November 13, 2017; Accepted: February 19, 2018; Published online: July 1, 2018. Dietary therapy is increasingly used to manage gastrointestinal (GI) symptoms in patients with irritable bowel syndrome (IBS). We aim to gauge United States gastroenterologists’ perceptions of dietary therapies for IBS. We distributed a 22-question survey to members of the American College of Gastroenterology. The survey was developed by gastroenterologists and survey methodologists. We collected information pertaining to demographics, providers’ interpretation of their patients’ views on dietary therapy, and gastroenterologists’ perceptions on dietary therapy, and nutritional counseling in IBS. One thousand five hundred and sixty-two (14%) surveys were collected. Nearly 60% of participants reported that patients commonly associate food with GI symptoms. IBS patients most commonly use a trial and error approach followed by a lactose-free and gluten-free diet, and rarely use a low fermentable oligosaccharides, disaccharides, monosaccharides, and polyols (FODMAP) diet on their own. Over half of providers recommend diet therapy to > 75% of IBS patients and most commonly recommend a low FODMAP diet. Only 21% of gastroenterologists commonly refer IBS patients to registered dietitians, and only 30% use GI dietitians. Female providers were more likely than males to recommend dietary changes as the primary mode of therapy (OR, 1.43 [1.09–1.88]; P = 0.009). Our national survey identified enthusiasm for diet treatment of IBS. While patients infrequently tried a low FODMAP diet on their own, GI providers commonly recommended this diet. Only a minority of GI providers refer their IBS patients to a registered dietitian for nutrition counseling and few refer patients to dietitians with specialized GI training. Female providers were more enthusiastic about diet therapies than males. Several dietary manipulations have subsequently been investigated in the treatment of IBS, including high-fiber diets, gluten-free diets, lactose-reduced diets, low fat diets, and diets low in fermentable oligosaccharides, disaccharides, monosaccharides, and polyols (FODMAPs).13–19 FODMAPs are short-chain carbohydrates that are poorly or incompletely absorbed in the small intestine and subsequently fermented by the colonic microbiota, leading to the production of short-chain fatty acids and gases such as hydrogen, carbon dioxide, and methane.7,20 They are found in foods such as wheat, garlic, onions, sweeteners, and some fruits and vegetables. Gluten, on the other hand, is a storage protein commonly found in wheat, rye, and barley. The purpose of this study is to describe how gastroenterologists currently approach the use of dietary therapy in the management of IBS patients. More specifically, we hoped to determine whether or not providers’ recommendations regarding dietary interventions differed from patients’ pre-consultative dietary behaviors, as well as aimed to identify any specific practice patterns that may warrant additional education and review. In addition, we sought to determine whether demographic factors such as provider gender, years of experience, or type of practice setting affected overall views and recommendations regarding dietary therapy. We developed a 22-item multiple-choice survey to assess how gastroenterologists approach the dietary management of IBS. Other secondary outcomes of this study were to obtain providers’ reports of their patients’ views on dietary therapy, to determine the frequency with which gastroenterologists recommend specific diets, to assess the value of registered dietitians and other modalities of nutritional education in IBS management, to investigate the barriers to delivering effective dietary interventions to patients with IBS, and to assess how these variables were affected by gender differences among survey participants. The survey was developed by 2 practicing gastroenterologists, one gastroenterology fellow, 3 registered dietitians, and one survey methodologist. The survey was reviewed by each of these individuals and modified until all stakeholders agreed on the survey content. The survey was then pilot tested among 25 gastroenterologists in different community and academic settings, as well as among 3 different advanced practice practitioners (nurse practitioners and physician’s assistants) prior to distribution. Feedback from these providers was used to further modify the survey instrument. The survey comprised of 4 main sections. The first section collected basic demographic information, including an assessment of participant gender, board certification, years of training in gastroenterology, primary practice site, region of practice, and percentage of outpatient clinic time spent treating patients with IBS. The second section included questions specifically related to the provider’s interpretation of their patients’ perceptions regarding foods that provoke GI symptoms and their patients’ initial self-management of their IBS. The third section pertained to gastroenterologists’ approach to the dietary management of IBS, including an inquiry into how physicians are prescribing specific diets and their subsequent views of the efficacy of these interventions. The fourth section assessed which resources are being utilized for nutritional advice and counseling (including the use of registered dietitians), and what barriers exist to providing effective dietary interventions to IBS patients (ie, complexity of the diet, potential expense of the diet, insurance coverage for dietician visits, meal preparation time, etc). The entire survey instrument can be found in the Appendix. The finalized survey was distributed electronically to all practicing gastroenterologists and gastroenterologists in training who were active members of the American College of Gastroenterology (ACG). The survey was administered using the principles established by the Tailored Design Method22 and was ultimately disbursed by the University of Minnesota using the Qualtrics web survey system in August 2015. A notification email regarding an upcoming survey was sent to members of the ACG 5 days prior to the final survey distribution. A reminder email was also sent to complete the survey one day prior to the conclusion of the survey period. A lottery system for gift cards was used as an incentive to complete the survey. Survey responses were summarized using simple proportions. Multivariate logistic regression analyses were performed to examine the association of provider gender with responses adjusting for years out of training, primary practice site, and percentage of outpatient practice time devoted to the management of IBS. Odds ratios (ORs) and confidence intervals were subsequently calculated for the relationship between gender and applicable variables (recommending diet as primary therapy, delivering nutritional advice via mobile apps, using continuing medical education (CME) courses on diet therapy to train physicians, etc). Statistical significance was defined as a two-sided P-value of < 0.05 for all tests. Analyses were performed using SAS (v9.3; SAS Institute, Cary, North Carolina, USA). A total of 10 952 surveys were emailed to physician members of the ACG. Out of these emails, 424 emails bounced and 10 528 emails were successfully delivered. There were a total of 1417 complete responses and 145 partial responses, totaling 1562 received surveys (14.3% response rate). The majority of respondents were men (75.0% men vs 24.1% women), which is in concordance with the overall membership of the ACG and traditional gender disparities within the field of gastroenterology.21,23 Other characteristics of the population of respondents were similar to the overall membership of the ACG. The vast majority of respondents were board certified in gastroenterology (84.0%) and had completed their GI training over 20 years prior (36.7%). The survey population represented a geographically diverse group of US providers (South 33.2%, Northeast 27.1%, Midwest 23.1%, and West 16.6%). GI physicians who participated in this survey were most likely to practice either in an academic (41.9%) or a private GI setting (32.4%). Survey respondents also indicated that they spend a substantial proportion of their time caring for patients with IBS. For instance, over three-quarters of GI providers spend 10–50% of their time in the clinic caring for IBS patients. Additional characteristics of the study population are described in Table 1. Nearly 60% of surveyed gastroenterologists reported that their patients “usually” (45.6%) or “almost always” (13.6%) describe an association between consuming food and the development of GI symptoms. 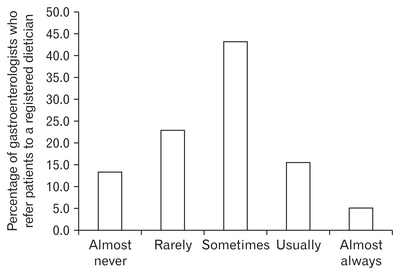 Another 37.1% reported that their patients “sometimes” describe this association. Similarly, survey participants indicated that over half of IBS patients “usually” (38.8%) or “almost always” (13.8%) attempt to self-manage their IBS symptoms prior to seeking advice from a gastroenterologist. We also asked GI providers to report how often their patients had tried different diet interventions, including a “trial and error” approach, lactose restriction, gluten restriction, low fat, or a low FODMAP diet, prior to seeing them for the first time. 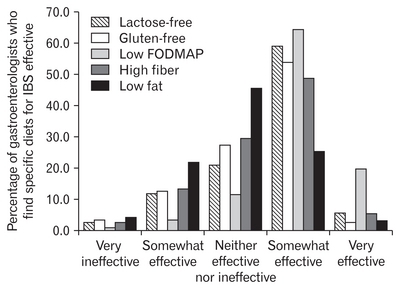 From highest to lowest, the proportion of providers who indicated that their patients had “usually” or “almost always” tried each diet were: trial and error (50%), lactose-reduced (33%), gluten-free (24%), low fat (6%), and low FODMAP (2%). Consistent with that, 70% of GI providers reported that their IBS patients had either “rarely” or “almost never” tried a low FODMAP diet before their initial visit (Table 2). Our survey population endorsed substantial confidence in diet therapies for IBS. Three-quarters of surveyed providers reported that they recommend diet therapies to at least half of their IBS patients, and over half of providers recommend diet therapies to over 75% of their IBS patients. Over half of surveyed gastroenterologists viewed diet modification as a primary (rather than secondary) management strategy for IBS. When asked about the effectiveness of diet therapies relative to other available treatments for IBS, we were surprised to find that over 90% of survey respondents indicated that diet was “about the same” (45%), “better” (41%), or “much better” (5%). Three-quarters of respondents felt that scientific evidence was “important” or “very important” to their decision of whether or not to recommend diet therapies. Physicians were also questioned regarding how often they recommend specific diet interventions to their IBS patients, including lactose reduced, gluten-free, low FODMAP, high fiber, and low fat diets. From highest to lowest, the proportion of providers who recommended each diet “usually” or “almost always” were: low FODMAP (77%), high fiber (45%), lactose-reduced (45%), low fat (18%), and gluten-free (12%). Though most providers did not routinely recommend a gluten-free diet, 41% of providers admitted that they recommend it “sometimes” (Table 3). Providers perceived a low FODMAP diet to be the most effective dietary therapy for their IBS patients, with 85% of gastroenterologists reporting the low FODMAP diet to be “very effective” (20%) or “somewhat effective” (65%). A majority of surveyed gastroenterologists found a lactose-free diet (65%), a gluten-free diet (57%), and a high fiber diet (54%) to be “very effective” or “somewhat effective” for their IBS patients. A low fat diet was perceived to be the least effective dietary therapy for IBS, with only 28% of respondents finding the diet to be “very effective” or “somewhat effective” (Fig. 1). In multivariate analysis, female gastroenterologists were more likely than male gastroenterologists to recommend a low FOD-MAP diet (P < 0.001) or a gluten-free diet (P = 0.001) for their IBS patients. When adjusting for years out of training, primary practice site, and outpatient time treating IBS patients, this relationship was only significant for a gluten-free diet (P = 0.002). Female GI providers were also more likely to find a lactose-reduced diet (P = 0.001), gluten-free diet (P < 0.001), low FODMAP diet (P < 0.001), and low fat diet (P = 0.035) to be effective dietary therapy for IBS than were male providers. However, when adjusting for years out of training, primary practice site, and outpatient time treating IBS patients, female gastroenterologists were only more likely to find a gluten free diet (P < 0.001) and a low FODMAP diet (P = 0.004) to be more effective. Female gastroenterologists were also more likely than males to recommend dietary interventions as the primary mode of therapy for IBS (OR, 1.43 [1.09–1.88]; P = 0.009) (Table 4). More than half of surveyed gastroenterologists were “comfortable” (38%) or “very comfortable” (18%) with providing dietary counseling to their IBS patients. Fewer than 10% were “not very comfortable” or “not at all comfortable” with this task. The most commonly used modalities to provide nutritional advice included educational handouts (81%), referral to a dietitian (70%), and verbal instructions (52%). Books (7%) and apps for smart phones/tablets (9%) were the least popular educational modalities. Only 21% of study participants reported that they “usually” or “almost always” referred their IBS patients to a registered dietitian for nutritional counseling (Fig. 2). When ordering a consultation with a dietitian, over 50% of gastroenterologists utilized a general dietitian. Only 30% referred their patients to a more specialized GI dietitian. Interestingly, 78% of respondents said that they believed that a registered dietitian with an IBS focus would enhance the delivery of dietary therapy to their IBS patients. When patients were ultimately referred to a registered dietitian, 51% of gastroen-terologists indicated that they “usually” or “almost always” provide specific diet recommendations to the dietitian. In addition to the enrichment provided by registered dietitians, surveyed gastroenterologists also reported that written handouts (74.7%), educational websites (72.4%), payer coverage of dietary consults and therapy (70.9%), and nutrition classes (65.4%) would help to enhance the delivery of dietary therapy to IBS patients. In multivariate analysis, female GI providers were more likely than males to believe that access to a registered dietitian knowledgeable about IBS to be important in the decision of whether or not to recommend dietary therapy (P = 0.014). Female gastroenterologists were also more likely to recommend books (P = 0.012), refer patients to a dietitian (P = 0.018), and recommend an app for a smart phone/tablet (P = 0.002) than were male physicians. When adjusting for years out of training, primary practice site, and outpatient time treating IBS, this difference was only significant for using an app on a smart phone/tablet (OR, 1.89 [1.22–2.92]; P = 0.004). Female GI physicians were more likely than male GI physicians to believe that nutrition classes (P < 0.001), CME courses to train GI physicians (P < 0.001), and increased availability of registered dietitians with an IBS focus (P = 0.005) could enhance the delivery of dietary therapy to patients. When adjusting for years out of training, primary practice site, and outpatient time treating IBS patients, this relationship was only significant for CME courses (OR, 1.52 [1.18–1.97]; P = 0.001) (Table 4). There were several factors that surveyed gastroenterologists believed to be potential barriers to providing effective dietary interventions to their IBS patients. The most significant of which included the complexity of dietary therapy (39.1% and 11.4% of physicians indicated that this is usually or always a hindrance) and the insurance coverage for dietitian visits (24.1% and 16.9% of physicians believed this to usually or almost always be a barrier). Our survey of over 1500 members of the ACG represents the largest survey to address gastroenterologists’ perceptions and practices surrounding food in the management of IBS. The association between food intake and GI symptoms is commonly based on previously published surveys of IBS patients.9 Similarly, our study found that GI providers believe that almost 60% of IBS patients relate their GI symptoms to eating a meal. This common association may account for why such a large proportion of IBS patients have tried diet manipulations to relieve their intestinal discomfort prior to seeking the advice of a gastroenterologist. Multiple observational and randomized controlled trials have demonstrated that a low FODMAP diet may reduce the frequency and severity of GI symptoms in IBS patients.19,24,25,34,35 However, it is important to note that long-term efficacy and safety data are currently lacking and many of the existing studies have significant methodological limitations.8 Of course, this statement could fairly be applied to all dietary interventions offered to IBS patients, and many of the previous criticisms of the low FODMAP diet trials have recently been addressed in a study by Staudacher et al.36 The results of our study indicate that the majority of US GI providers are conscious of this growing body of evidence in support of the low FODMAP diet and are now frequently recommending this diet to their IBS patients. Several discrepancies also existed regarding gastroenterologists’ preferences in choosing a specific dietitian. The majority of physicians would refer their IBS patients to a general dietitian outside of their GI group, whereas few physicians would use a specialized GI dietitian. However, over 70% of gastroenterologists believed having direct access to registered dietitians with an IBS focus would enhance the delivery of dietary therapy. When considering complex, multi-step, highly restrictive interventions like the low FODMAP diet, the distinction between a general dietitian who may or may not have experience in caring for patients with GI disorders and a GI dietitian is particularly important. The results of our study indicate that gastroenterologists infrequently utilize specially trained GI dietitians and instead are opting to refer patients to general dietitians, even though the majority believes that GI dietitians would be of benefit to their IBS patients. This could imply that the choice to refer IBS patients to general dietitians may be more of a reflection of availability and access to GI dietitians than actual preference for general dietitians. On the other hand, the limited use of GI dietitians may also be a reflection of the severity of IBS cases that certain physicians encounter. For instance, a registered, general dietitian may be adequate for dietary education in mild to moderate cases of IBS, whereas specialized GI dietitians may be necessary in more severe or complicated scenarios. However, this is beyond the spectrum of our study and would require further investigation. It is also important for gastroenterologists to emphasize to their patients that the low FODMAP diet is not a strict lifetime diet, and it extends across 3 distinct stages: restriction, reintroduction, and maintenance. This requires a considerable amount of time and investment by patients and providers, illustrating gastroenterologists’ increasing need for access to dietitians with adequate interest and training in nutritional interventions for GI conditions. In addition to referring patients to registered dietitians, surveyed gastroenterologists commonly used educational handouts to help deliver nutritional advice to IBS patients. Printed information sheets represent one of the simplest methods of delivering nutritional advice. However, providers are cautioned against using a handout as a lone means of educating patients about complex interventions like the low FODMAP diet. Patients should ideally be referred to a GI dietitian, but if this is not feasible, other educational material (such as handouts) should be provided to help guide patients through the elimination, reintroduction, and maintenance phases of the plan. Educational websites and apps for smart phones are other newer tools with the advantages of engaging comprehensive education and symptom monitoring capabilities38; however, fewer than half of GI providers felt that such means would enhance their ability to provide dietary therapies to their IBS patients. This may be secondary to a lack of awareness of such resources, or perhaps it is a reflection of how well patients are responding to the more traditional methods of verbal communication combined with instructional handouts. Of the subgroup analyses we conducted, comparisons between perceptions and practices of female vs male providers merits special attention. Our survey identified a significant difference in the dietary management of IBS patients between female and male GI providers. For instance, when adjusting for confounding variables, females were more likely to use dietary interventions as the primary mode of therapy for IBS patients than were males. Female GI providers were also more likely to prescribe a gluten-free diet and to find both a gluten-free diet and a low FODMAP diet more efficacious than were males. While the reasons for this are unclear, it is interesting to wonder if there are inherent gender differences in the way men and women perceive nontraditional treatments such as diet therapies versus more traditional medical therapies. Or perhaps women are more diet conscious than men, leading them to prescribe certain diets with a higher frequency. Female GI physicians were also more likely than males to recommend using an app on a smart phone or tablet to help deliver dietary advice. Similarly, a recent study by Elavsky et al39 also found that individuals who use mobile apps for nutrition, weight loss, and fitness are more likely to be female. Further research is needed to determine whether gender discrepancies in the use of health related mobile apps are consistent, or if these findings could potentially influence the development of future dietary applications. Another interesting observation was the marked variability in regional response rates to our survey, with the majority of responders residing in the Southern regions of the US. Although this was unlikely to lead to bias in those recommending dietary solutions, additional research may be warranted to determine if this is a stable finding, as it could potentially indicate the need to modify survey methodology on a regional basis in the future. Our study also has a number of potential limitations, which should be taken into consideration when interpreting the results. One particular limitation is the potential for response bias. For example, the GI providers choosing to participate in this study may have had a particular interest in IBS or increased background knowledge of dietary interventions. Though response bias is possible, we would point out that our response rate of 14% and sample size of over 1500 US GI providers represents the largest survey addressing dietary therapies for IBS conducted to date. In addition, our survey was only distributed to gastroenterologists and did not include input from actual patients, primary care physicians, or nurse practitioners. Results pertaining to patients’ dietary practices were rather extrapolated from the beliefs of the surveyed gastroenterologists. Primary care physicians and mid-level practitioners are often the principle providers for a number of patients with IBS, and further studies would be needed to determine if any differences exist between the practice patterns of these primary providers and those of gastroenterologists. Another limitation of any survey study is whether participants’ responses to questions accurately reflect their actions in clinical practice. This survey was administered using a web-based platform, and it is possible that this may have introduced bias by excluding GI providers without access to the Internet. In the age of electronic health records, this seems unlikely to have significantly affected our results. Finally, this survey was conducted in 2015. It would be very interesting to repeat the survey again to see if perceptions and practices regarding dietary therapies for IBS have changed or evolved. Given the substantial number of published studies on the low FODMAP diet since this time, we would anticipate an even greater awareness and utilization of this diet in clinical practice. A complex relationship exists between diet and the provocation of GI symptoms in IBS patients, and there is an ever-expanding body of evidence to support a role for dietary therapy in this population. Overall, GI providers who participated in this survey expressed a favorable view of the value and effectiveness of dietary intervention in IBS patients. However, a discrepancy was identified between the initial type of diet utilized by patients and that which was recommended by physicians. There is increasing evidence to support the efficacy of the low FODMAP diet in IBS patients, and our observed disconnect highlights the need for increased patient education on this topic. Overall, this survey has highlighted the nationwide practice patterns of gastroenterologists regarding dietary therapies for IBS patients. It has additionally illustrated the need for dietitians knowledgeable in the dietary management of IBS. We thank Scott Lunos (statistical analyses), Todd Rockwood (survey content, design, and methodology), Barb Benson (survey content expert), Shelly Wymer (preparation and transmission of the electronic survey), and start-up grant of Department of Medicine, University of Minnesota Medical School. Fig. 1. How often do gastroenterologists find specific dietary therapies effective for the treatment of irritable bowel syndrome (IBS)? FODMAP, fermentable oligosaccharides, disaccharides, monosaccharides, and polyols. Fig. 2. How often do gastroenterologists refer their irritable bowel syndrome patients to a registered dietitian? GI, gastrointestinal; IBS, irritable bowel syndrome. “n” is variable secondary to partial survey responses and exclusion of fellows-in-training from answering certain demographic questions. How Often Will Patients Have Tried the Following Diets Before Being Seen by a Gastroenterologist? FODMAP, fermentable oligosaccharides, disaccharides, monosaccharides, and polyols. Total number of gastroenterologists responding that their patients will have used the following diets to self-manage their irritable bowel syndrome (IBS). The number within each parenthesis indicates the percentage of total respondents. How Often Do Gastroenterologists Recommend the Following Diets to Irritable Bowel Syndrome Patients? Total number of gastroenterologists responding how often they prescribe the following diets for irritable bowel syndrome (IBS) patients. The number within each parenthesis indicates the percentage of total respondents. CME, continuing medical education; GI, gastrointestinal; IBS, irritable bowel syndrome. Author contributions: Adrienne Lenhart: original manuscript writing and editing and data interpretation; Courtney Ferch: survey design and methodology; Michael Shaw: survey design and methodology, data interpretation, statistical analysis, and manuscript editing; and William D Chey: survey design and methodology, data interpretation, manuscript editing, and supervision. Mayer EA. Clinical practice. Irritable bowel syndrome. N Engl J Med 2008;358:1692-1699. Lovell RM, Ford AC. Global prevalence of and risk factors for irritable bowel syndrome: a meta-analysis. Clin Gastroenterol Hepatol 2012;10:712-721. Jones R. Treatment of irritable bowel syndrome in primary care. BMJ 2008;337:a2213. Drossman DA, Camilleri M, Mayer E, Whitehead WE. AGA technical review on irritable bowel syndrome. Gastroenterology 2002;123:2108-2131. Cash B, Sullivan S, Barghout V. Total costs of IBS: employer and managed care perspective. Am J Manag Care 2005;11(1 suppl):S7-S16. Talley NJ, Gabriel SE, Harmsen WS, Zinsmeister AR, Evans RW. Medical costs in community subjects with irritable bowel syndrome. Gastroenterology 1995;109:1736-1741. Chey WD. Food: the main course to wellness and illness in patients with irritable bowel syndrome. Am J Gastroenterol 2016;111:366-371. Krogsgaard LR, Lyngesen M, Bytzer P. Systematic review: quality of trials on the symptomatic effects of the low FODMAP diet for irritable bowel syndrome. Aliment Pharmacol Ther 2017;45:1506-1513. Böhn L, Störsrud S, Törnblom H, Bengtsson U, Simrén M. Self-reported food-related gastrointestinal symptoms in IBS are common and associated with more severe symptoms and reduced quality of life. Am J Gastroenterol 2013;108:634-641. Locke GR, Zinsmeister AR, Talley NJ, Fett SL, Melton LJ. Risk factors for irritable bowel syndrome: role of analgesics and food sensitivities. Am J Gastroenterol 2000;95:157-165. Monsbakken KW, Vandvik PO, Farup PG. Perceived food intolerance in subjects with irritable bowel syndrome-- etiology, prevalence and consequences. Eur J Clin Nutr 2006;60:667-672. Simrén M, Månsson A, Langkilde AM, et al. Food-related gastrointestinal symptoms in the irritable bowel syndrome. Digestion 2001;63:108-115. Moayvedi P, Quigley EM, Lacy BE, et al. The effect of fiber supplementation on irritable bowel syndrome: a systematic review and meta-analysis. Am J Gastroenterol 2014;109:1367-1374. Moayyedi P, Quigly EM, Lacy BE, et al. The effect of dietary intervention on irritable bowel syndrome: a systematic review. Clin Transl Gastroenterol 2015;6:e107. Vazquez-Roque MI, Camilleri M, Smyrk T, et al. A controlled trial of gluten-free diet in patients with irritable bowel syndrome-diarrhea: effects on bowel frequency and intestinal function. Gastroenterology 2013;144:903-911.33. Aziz I, Trott N, Briggs R, North JR, Hadjivassiliou M, Sanders DS. Efficacy of a gluten-free diet in subjects with irritable bowel syndrome-diarrhea unaware of their HLA-DQ2/8 genotype. Clin Gastroenterol Hepatol 2016;14:696-703, e1. Staudacher HM, Lomer MC, Anderson JL, et al. Fermentable carbohydrate restriction reduces luminal bifidobacteria and gastrointestinal symptoms in patients with irritable bowel syndrome. J Nutr 2012;142:1510-1518.
de Roest RH, Dobbs BR, Chapman BA, et al. The low FODMAP diet improves gastrointestinal symptoms in patients with irritable bowel syndrome: a prospective study. Int J Clin Pract 2013;67:895-903. Böhn L, Störsrud S, Liljebo T, et al. Diet low in FODMAPs reduces symptoms of irritable bowel syndrome as well as traditional dietary advice: a randomized controlled trial. Gastroenterology 2015;149:1399-1407, e2. Shepherd SJ, Lomer MC, Gibson PR. Short-chain carbohydrates and functional gastrointestinal disorders. Am J Gastroenterol 2013;108:707-717. Brotherton SE, Etzel SI. Graduate medical education, 2014–2015. JAMA 2015;314:2436-2454. Dillman DA, Smyth JD, Melani L. . Internet, mail, and mixed-mode surveys: the tailored design method. 3rd edn. Hoboken, NJ: John Wiley & Sons 2009. Diamond SJ, Thomas CR, Desai S, et al. Gender differences in publication productivity, academic rank, and career duration among U.S. academic gastroenterology faculty. Acad Med 2016;91:1158-1163. Halmos EP, Power VA, Shepherd SJ, Gibson PR, Muir JG. A diet low in FODMAPs reduces symptoms of irritable bowel syndrome. Gastroenterology 2014;146:67-75, e5. Eswaran SL, Chey WD, Han-Markey T, Ball S, Jackson K. A randomized, controlled trial comparing the low FODMAP diet vs. modified NICE guidelines in US adults with IBS-D. Am J Gastroenterol 2016;111:1824-1832. Camilleri M, Lembo AJ, Lavins BJ, et al. Comparison of adequate relief with symptom, global, and responder endpoints in linaclotide phase 3 trials in IBS-C. United European Gastroenterol J 2015;3:53-62. Chey WD, Chey WY, Heath AT, et al. Long-term efficacy and safety of alosetron in women with severe diarrhea-predominant irritable bowel syndrome. Am J Gastroenterol 2004;99:2195-2203. Camilleri M, Northcutt AR, Kong S, Dukes GE, McSorley D, Mangel AW. Efficacy and safety of alosetron in women with irritable bowel syndrome: a randomised, placebo-controlled trial. Lancet 2000;355:1035-1040. Chey WD, Dove LS, Andrae DA, Covington PS. Early response predicts a sustained response to eluxadoline in patients with irritable bowel syndrome with diarrhea in two phase 3 studies. Aliment Pharmacol Ther 2017;45:1319-1328. Drossman DA, Chey WD, Johanson JF, et al. Clinical trial: lubiprostone in patients with constipation-associated irritable bowel syndrome--results of two randomized, placebo-controlled studies. Aliment Pharmacol Ther 2009;29:329-341. Chey WD, Lembo AJ, Lavins BJ, et al. Linaclotide for irritable bowel syndrome with constipation: a 26-week, randomized, double-blind, placebo-controlled trial to evaluate efficacy and safety. Am J Gastroenterol 2012;107:1702-1712. Holt DQ, Strauss BJ, Moore GT. Patients with inflammatory bowel disease and their treating clinicians have different views regarding diet. J Hum Nutr Diet 2017;30:66-72. Biesiekierski JR, Newnham ED, Irving PM, et al. Gluten causes gastrointestinal syptoms in subjects without celiac disease: a double-blind randomized placebo-controlled trial. Am J Gastroenterol 2011;106:508-514. Whigham L, Joyce T, Harper G, et al. Clinical effectiveness and economic costs of group versus one-to-one education for short-chain fermentable carbohydrate restriction (low FODMAP diet) in the management of irritable bowel syndrome. J Hum Nutr Diet 2015;28:687-696. Ong DK, Mitchell SB, Barrett JS, et al. Manipulation of dietary short chain carbohydrates alters the pattern of gas production and genesis of symptoms in irritable bowel syndrome. J Gastroenterol Hepatol 2010;25:1366-1373. Staudacher HM, Lomer MCE, Farquharson FM, et al. A diet low in FODMAPs reduces symptoms in patients with irritable bowel syndrome and a probiotic restores bifidobacterium species: a randomized controlled trial. Gastroenterology 2017;153:936-947. O’Keeffe M, Lomer MC. Who should deliver the low FODMAP diet and what educational methods are optimal: a review. J Gastroenterol Hepatol 2017;32(suppl 1):23-26. Ankersen DV, Carlsen K, Marker D, Munkholm P, Burisch J. Using eHealth strategies in delivering dietary and other therapies in patients with irritable bowel syndrome and inflammatory bowel disease. J Gastroenterol Hepatol 2017;32(suppl 1):27-31. Elavsky S, Smahel D, Machackova H. Who are mobile app users from healthy lifestyle websites? Analysis of patterns of app use and user characteristics. Transl Behav Med 2017;7:891-901.